CLICK HERE for more information about our Summer Workshops. 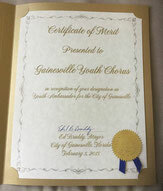 The Gainesville Youth Chorus received the designation of Youth Cultural Ambassadors for the City of Gainesville on February 5, 2015 from Mayor Ed Braddy and the City Commission. Afterwards a small ensemble from GYC sang God Bless America. Our 2018-2019 GYC reusable discount cards are available for purchase now for just $10. Get yours today! AmazonSmile is a simple and automatic way to support GYC everytime you shop, at no cost to you! Grants from the sale of Florida's "State of the Arts" license plate support the arts in our community. Established in 1994, the Gainesville Youth Chorus (GYC) is a not-for-profit, regionally based chorus for boys and girls ages 8-18 that has become a children's international touring choir. Our mission is to create an atmosphere in which children can develop and advance their musical talent, demonstrate personal and artistic growth, experience true joy and passion for singing through choral performances, and serve as cultural ambassadors for Gainesville, Florida, USA. GYC has two principle performing groups; Concertina Choir and the Concert Choir. The State of Florida, Department of State, Division of Cultural Affairs, the Florida Council, and the City of Gainesville Division of Cultural Affairs.